Desperate Times, hard truths, unexpected dangers. One extraordinary summer will change a young boy and his family...forever. Tally Spruill: [after taking a bath in the lake] You saw me, didn't you Luke? I happened upon this film quite by accident, while channel surfing for something to watch to fill in the time while waiting for it to be Christmas at midnight. What a pleasant surprise! Unlike most people, I'm not a big John Grisham reader, and had never heard of the book on which it's based, but having seen the film and read viewer reviews, I'm now eager to read the book. The one thing I didn't like about the film is that it ends too abruptly, with too many loose ends in the plot - particularly whether Ricky returns from the Korean War alive or not. There was such a sense of it being incomplete that I went to IMDb to check whether it was a two-part film or a mini-series and if so, where could I watch the rest of the story! 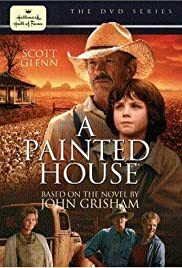 What I really liked about "A Painted House" is that it really got across a strong sense of time and place for the cotton belt in the early 1950's. It conveyed the fact that these were simpler and in some ways more "wholesome" times, but unlike most Hallmark Channel fare, not in a saccharine way. Instead, it dealt with a lot of gritty, real-life issues like murder, unwed motherhood, ethnic and class tensions, and the moral compromises sometimes inherent in the small town mentality, but not in an overblown, sensationalist way, which I think was a particularly important balance to be struck for an autobiographical coming of age film told from the perspective of a 10 year old boy. Overall, the acting was very good, and I was pleasantly surprised to see Robert Sean Leonard from "House" as the young Grisham's father. By far the most memorable performance was Scott Glenn's portrayal of the grandfather, but Melinda Dillon (who turns out to be from Arkansas) was also excellent as the grandmother as was young Logan Lerman in the lead role and Pablo Schreiber as Hank, the bad boy of the Spruill "hill people" family of migrant workers. As someone who frequently works as either a production designer, costume designer or in some crew capacity involving art department / wardrobe / historical authenticity and general "look and feel" of an era, I've got to give major accolades to the production design team on this one and to other departments involved in the broad area of "look and feel" The locations were superb, the set dressing and costuming authentically styled and realistic aged / distressed, so that everybody looked like actual rural poor people. Too many shows overdo the dirt and it looks fake and ends up being condescending. On this film, clothes were shown to be sun-faded, worn and stained but with people making a respectable attempt to keep clean despite their limited means. When the cousin from up north came to visit with his Yankee / city slicker wife, the contrast was very effective. There were lots of wonderful 1950s props but these were presented in a realistic way, as an accretion of things from various earlier eras leading up to the early 50's. (Fabulous job on picture cars, particularly considering how many had to be acquired.) As a result, there was a real, palpable sense of time and place, which really "made" the film for me. The single exception in this area is that some of the men should have either had shorter hair or been Brylcreme'd to look right for 1952. "A little dab'll do ya" would have done wonders. Another pleasant surprise was going to IMDb to read the credits and finding out that the 1st and 2nd AD were people I actually know and have worked with before on other period-piece type projects. No wonder the details on this film were so good -- Donald Eaton and Lynne Wegenka know their stuff and make the trains run on time. Overall, I really enjoyed this film, even thought I felt that it left the audience hanging at the end, and am inspired to get a copy of the book and read it, in hopes that it will flesh out some of the missing parts of the story.